April 6-13 available as 2 or 3 bedroom rental? Contact me for a special spring rate! SUNSET BEACH SERVICE March through October with two chairs and 1 umbrella, additional service may be purchased upon arrival. 2 bedroom/2 bath rate upon request, message me for details. HEATED POOL at The Pearl of Navarre Beach. WILSON'S BEACH IS OWNED AND MANAGED BY ADRIENNE WILSON and may be reserved through the VRBO website. NAVARRE BEACH was recognized in 2017 as one of The South's BEST Tiny Towns in Southern Living Magazine. Visit our condo and find out why!!! All rentals must be requested through the VRBO online. Great place for 'HOME SCHOOL" family vacation outings! Our grand kids call Navarre "PAPA"S BEACH"! The BEST beach ever. Make some family memories and retreat from your crazy life to the peaceful gulf shore. This Navarre Beach condo has a unique modified open floor plan unlike the other 3/3 units at the Pearl! SUNSET BEACH SERVICE included March thru October. Additional chairs may be reserved at the seasonal rate of $150/6 for days or $30-35 per day. April '13 recognized Navarre Beach as a perfect less crowded beach and family friendly paradise. NAVARRE BEACH received '2012 THE BEST RESTORED BEACH' award! REEF areas for snorkeling recently added to Navarre Beach. One of the TOP 10 Frommer's Guide 2010 vacation spots. Voted one of the best 10 beaches in North America by Boston University. See dolphins, sting rays at play in the blue gulf waters while sitting on the balcony with your favorite beverage!!! Enjoy the peace and joy of a sunrise and a sunset at our beach. This condo has been renovated (wasted entry foyer walls REMOVED!) to provide open flowing living area from the entry door through the kitchen, dining area and family room, all the way to the Gulf front balcony. Very open kitchen/breakfast area with lots of extra space including a twin sleeper sofa with views of the Navarre Pier. Your children and grandchildren are welcome to our family's second home! Our renters are families, siblings, cousins and friends from all over, and we have many repeat renters that make us their special beach place to go. Juana's Bar and Sailor's Grill are in walking distance to the condo. Enjoy live music nightly at Juana's Bar on the island. Yoga and Zumba classes weekly at Juana's. The Navarre Pier now has a place to enjoy food on the deck. The Navarre Fishing Pier is the longest in the Gulf. market coming soon. We loved the Fried Green Tomato Shrimp Po'Boy. Located on the beautiful Emerald Coast of Navarre Beach, this 1770 square foot, get-a-way will accommodate your needs as a two or three bedroom unit (Two Master Suites). Navarre Beach has snow-white, sandy beaches and turquoise waters, situated on 20 miles of federally protected land. It's between Destin and Pensacola without the traffic and crowds. Shopping IF NEEDED is not too far away. Comfy family room furnishings, 47' flat screen/ Blue Ray DVD and custom art work. Nine-foot ceilings and floor to ceiling south and east view windows. Dining area with views of the Navarre Fishing Pier. Granite counters in furnished kitchen, dining room, wet bar, efficiency kitchenette and breakfast bar. Whirlpool refrigerator with filtered water and icemaker. Wet bar includes ice-making machine. Gulf-front master suite, flat screen/dvd, large walk-in closet, jacuzzi marble tub, and separate walk-in shower. Guest bedroom with two queen-size beds, tv/dvd and separate bath. Bay side master bedroom efficiency suite with flat screen TV/DVD, complete with granite kitchenette, stack washer/dryer, jacuzzi marble tub, and balcony with bay view. Additional washer/dryer off kitchen. *Damage insurance $59.00 through VRBO website. Ron and Adrienne Wilson at one of our favorite places to enjoy the beach food. Our family includes 2 daughters, 2 son-in-laws, and 6 grandkids who all LOVE 'Papa's' Navarre Beach! Renovated open floor plan unlike other end units at the Pearl. Nice private balcony with great views of the Gulf! We spent many years looking from the Florida Keys to Navarre Beach. WE love how quickly we can get to the beach from Atlanta. The Gulf Coast beaches are some of the most beautiful in the world. We also love the family atmosphere at Navarre Beach and the fact that even in prime season, it is not overcrowded. Relaxing on the large Gulf front balcony (with a good book and a favorite beverage) and enjoying all the views that a 14th floor balcony has to offer, is another family favorite before or after beach time! SAFE and UNCROWDED Beach! Sunset Beach Service rentals available for purchase by reservation for your visit to the beach. We also love the fact that we can walk or ride our bikes to Sailor's Grill for bakery goods, breakfast, lunch or dinner while we watch the bay and the volleyball matches from the outdoor deck. Yoga and Zumba classes on Tues and Thurs. at Juana's! Broussard's opened on the Gulf with a market to open soon. Grouper Reuben and Fish Tacos from T.C. 's Front Porch is just across the bridge on the mainland. Your family will make their memories at 'Papa's Beach' too! 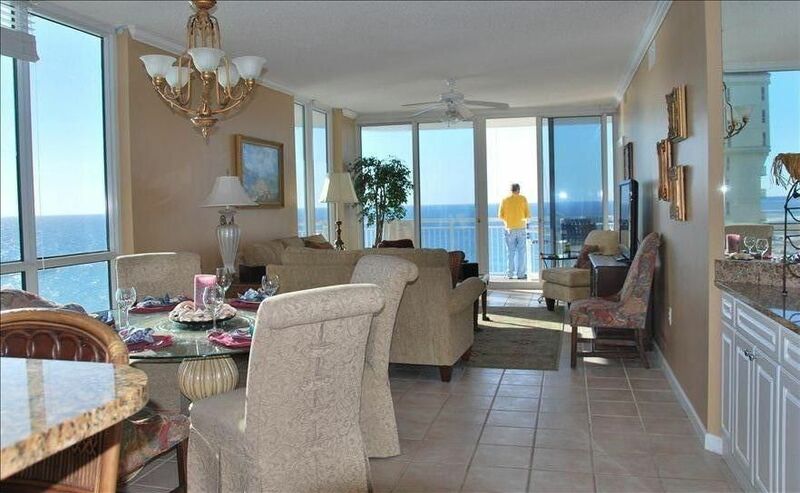 The Pearl of Navarre is an 18 story beachfront condo. Unique prime property which developer chooses as his personal beach condo. Excellent Homeowners Association keeps property in top condition.